Q. Where can I go to search other theological library catalogs? To start, most academic and seminary libraries are member's of the Online Computer Library Center (OCLC) and their union catalog, WorldCat. Fuller's library not only contributes to OCLC's records but uses WorldCat to host our own local holding records. This means you can use the same catalog interface you normally use at Fuller to search the holdings of most other seminary library catalogs simultaneously. 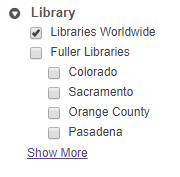 Simply select "Libraries worldwide" on the left hand column of the catalog search tools, instead of "Fuller Libraries." 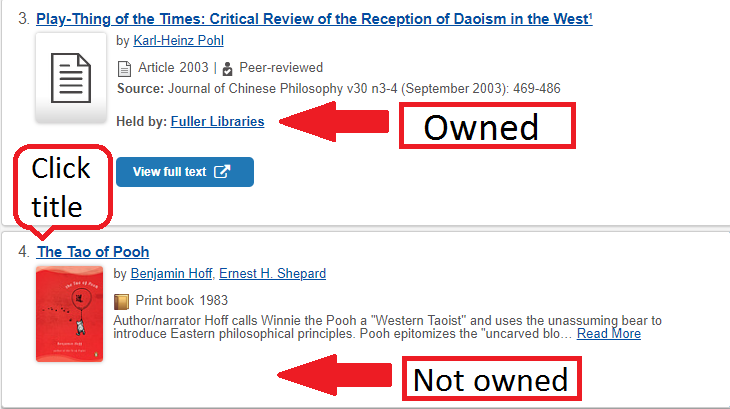 If you discover a desired title not owned by Fuller Seminary, you can use the catalog to view which libraries do own it, and you can link directly to that particular library's individual catalog. 1. First, determine if a title is held by Fuller or not. 2. If the title is not held by Fuller libraries, click on the item's title and scroll down to "availability," and "libraries worldwide." 3. Here you will will have the opportunity to select the "request item through interlibrary loan" button, as well as scroll down to see a list of institutions that currently hold the item. The list will display starting with the closest library, and the accompanying search bar allows you to check for holdings at a particular institution. 4. If you would like to check on the location and availability of an item at a particular non-Fuller institution, simply click on it's title and you will be directed to that institutions' catalog. Depending on the level of connectivity with WorldCat, this could pull up the individual item record or take you to the catalog homepage. Secondly, most (but not all) libraries have an Online Public Access Catalog (OPAC) which is freely available for all to search online. An effective method for searching another theological library catalog that you are particularly interested in is to conduct a web search for the institution and directly access the catalog through their website. For instance, a web search for Biola quickly led me to their library catalog. Lastly, Fuller's Hubbard Library is a member of the American Theological Library Association (ATLA) and their Southern California Chapter, SCATLA. Member institutions have a program of reciprocal borrowing whereby Fuller students are granted access and some borrowing privileges at other theological libraries. This makes these non-Fuller Theological library catalogs of particular interest. Please see the attached file and link for a list of ATLA and SCATLA institutions that may grant Fuller students borrowing privileges at their respective libraries.